The E-Wolf E1 is a remarkably tasteful looking electric race car, with looks influenced by the Lotus 7, the “Sharknose” Ferrari 156 F1 and perhaps even the Light Car Companies “Rocket” the E-Wolf weighs in at just 500kgs (just over 1,100 pounds), very impressive considering the weight of the required lithium ion battery packs. The top speed is reported as 230kmph (143mph) with a 300km range, and a sub-5 second 0-100kmph time. 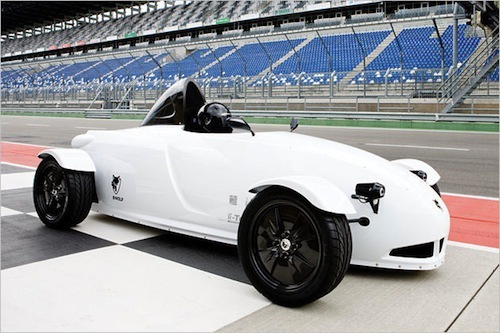 The E-Wolf e1 is street legal in the US and will only set you back 220,000 USD. Oh and you may need to lay off the butter, bacon and beer as its driver weight limit is set at 68kgs (150lbs). If you’re one of those people who can’t stand flash heavy websites you may want to sit down and take a deep breath before clicking through to the manufacturers website….